Last week in the mainstream media much of the commentary about the January 8 Tucson shootings reverted back to partisan bickering over the tone and impact of political vitriol. But in the social media, the post-Tucson conversation was kinder and gentler. Generally bloggers applauded a display of unity and bipartisanship. 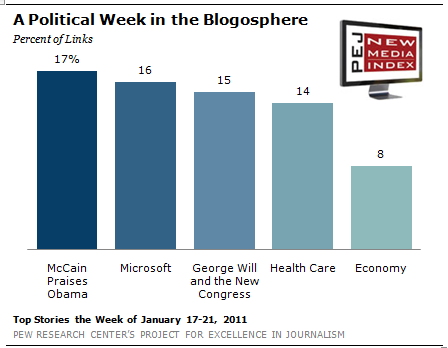 For the week of January 17-21, fully 17% of the news links on blogs went to a Washington Post op-ed by Republican Senator John McCain commending President Obama for his speech at the January 12 memorial service for those killed and injured in the Arizona shootings according to the New Media Index from the Pew Research Center’s Project for Excellence in Journalism. In a conversation dominated by liberals and moderates, those bloggers overwhelmingly praised McCain’s piece for showing what a reasonable discourse that reached across political lines would look like. Many also expressed surprise and respect for McCain, who they felt reverted to an earlier phase of his career when he was known for his independence and willingness to compromise. The other major political subject that gained substantial interest in the blogosphere last week (the No. 3 story at 15%), was a piece by conservative columnist George Will, which suggested confrontation more than cooperation. In it, Will asserted that Congress has bequeathed much of its lawmaking power to the Presidency and to other government agencies in recent years. The new 112th Congress, Will believes, needs to reassert its position and stand up to Obama’s agenda. Conservative bloggers strongly backed Will’s column, although there was some skepticism about whether the Republicans in Congress would be willing to take on the President in this way. Will’s work has become a popular catalyst for conversation online recently. Last week marks the fourth time in the last two months when one of his columns has been among the top five subjects linked-to on blogs in the PEJ analysis. This trend suggests that even though newspaper circulation is declining, well-known columnists can still be influential in political conversations in both the traditional and online media. Two other top stories on blogs last week involved major domestic issues. The fourth-biggest story was health care at 14%, a subject that has not been among the top topics online in almost four months. Most of the attention focused on a new government study written about in a Washington Post story showing that as many as 129 million Americans under the age of 65 have preexisting medical problems that are red flags for health insurers. The economy was the fifth-largest subject at 8% as bloggers linked to reports about the size of the U.S. government’s debt, now at $14 trillion, and global efforts to slow down rising food costs. The No. 2 story last week, at 16%, was back by popular demand. Bloggers linked to the same BBC interview with Microsoft chief executive officer Steve Ballmer that made the list of top stories the previous week. Bloggers focused on Ballmer’s hint that Microsoft will support the use of Kinect motion controllers with PCs sometime soon. 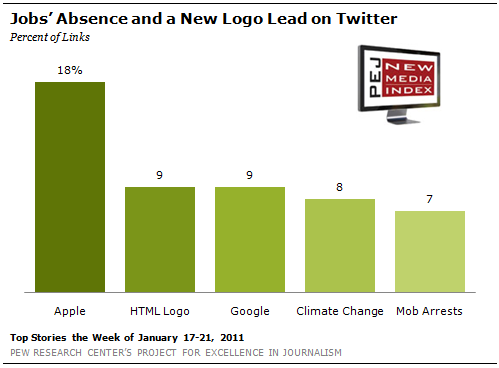 On Twitter, Apple was once again the leading subject; 8% of the links from the social networking site focused on the subject. The attention was split between two stories regarding the business aspects of the company. One was the impact of CEO Steve Jobs’ indefinite leave of absence for medical reasons; the other was a report about sales of the iPad, which surpassed the expectations of business analysts. The introduction of the logo for HTML5, the newest revision of the web programming language, was the second-largest subject with 9% of the links. And another technology story came next: The outcry over Google’s decision to replace the link to its RSS reader product on the top of its Gmail homepage was the No. 3 story, also at 9%. That was followed (at 8%) by a blog post from Greenpeace’s Dr. Paul Johnston arguing for more action on climate change and the need to cut greenhouse gas emissions in light of recent dramatic weather events. The fifth-biggest news story on twitter last week (at 7%) was a CNN report about one of the largest single-day operations taken against the Mafia stretching across Italy, New York, New Jersey and Rhode Island, resulting in the arrests of 127 people accused of organized crime activities. After John McCain wrote a column commending his 2008 presidential rival’s speech at the Tucson memorial, many liberal and moderate bloggers thought it represented the less ideological McCain who had been known as a maverick before growing more vocally conservative in recent years. Others expressed a guarded optimism that we might see a change in tone in Washington. Although in the minority, there were a few conservatives who viewed McCain’s actions much differently. “Barf Alert: McCain Says Obama is a Patriot,” read the headline of a post on The Freedom Fighter’s Journal. While McCain and some bloggers were interested in finding common ground, George Will and his online supporters were focused on a very different tack. To them, a key priority was having the newly empowered Republicans in Congress challenge executive authority. Some, however, weren’t sure if Republicans were up for the task. “The country is watching to see if this Congress has the seriousness of conviction to follow through on the rhetoric upon which they were elected,” added Fred Unger at Emerging Consensus. Not surprisingly, liberals did not share Will’s perspective. The most viewed news video on YouTube last week was of the dangerous January floods throughout large portions of Australia. According to reports, more than 17,000 homes lost electricity and the total cost of the damage could reach $2 billion. Taken on January 10 from the second floor of an office building in Toowoomba, the footage illustrates the scope of the flood waters and the extent of the damage. Cars are swept up in the powerful current while streets and buildings are flooded. The text that accompanies the YouTube video makes an appeal for donations to various relief efforts. This video is a good example of how the power of images spread throughout the internet can deliver the impact of tragedies to places far from the event, even without coverage from traditional media.